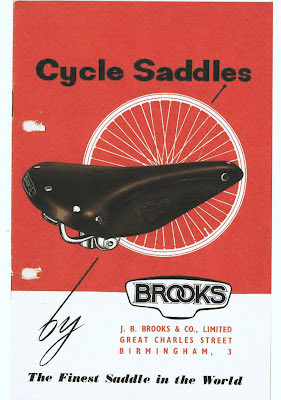 As you can see from my previous posts I'm a big fan of Brooks (England) leather saddles. I particularly like the combination of leather and steel in any bicycle saddle. I also like how they can last a lifetime if they are treated well, and in lasting for so long the older vintage leather saddles also carry with them a bit of history too. The saddle measures 280mm in length and is 110mm at its widest point toward the rear. It has a black enamelled steel frame and rails that have lost only a little enamel. The rails are fitted with the original chromed seatpost clamp. The metal frame underneath the saddle has no stampings or markings on it of any kind. 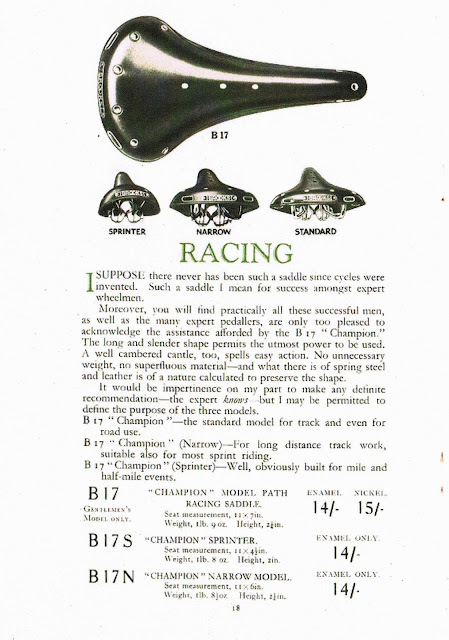 It has 3 steel rivets at the front of the saddle and 6 at the rear. The leather has a beautifully aged patina and carries a couple of small nicks and abrasions, it is mostly brown in color with a darker brown showing in places where the proofhide has soaked through the thickness of the saddle. The leather is 4mm thick and the sides of the saddle are both stamped with the circular Brooks logo that reads "MADE IN GREAT BRITAIN....BROOKS....CHAMPION B17 SPRINTER" as can be seen in the first photograph. At this point I have not been able to decipher the code and would welcome any thoughts that may solve the mystery! 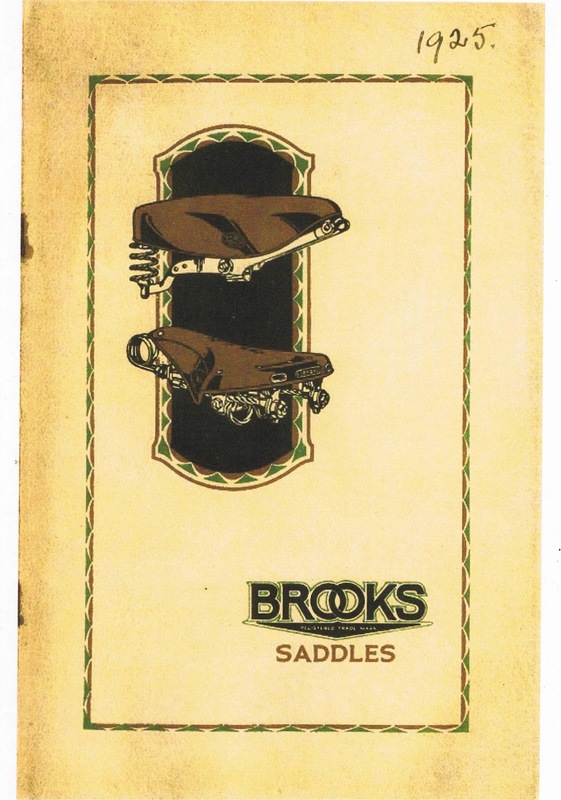 It's the old style of coding and due to the company changing ownership over the years I understand that Brooks no longer have the information available to decipher the codes. The rear name plate is fantastic. Its made from brass and is held to the leather by small copper rivets. It has lost a little of its paint which is consistant with its age. ﻿I've done a little research on the saddle and based on the styling of the name plate and the oval shaped Brooks logo on the side of the saddle I would imagine that this saddle was manufactured in the early 1950's, however I would be happy to be corrected. Hi James! I've read your article on the Rene Herse and I find it to be truly fascinating (the bike that is). I have a huge interest in vintage bicycles and have always wanted to own one of my own. 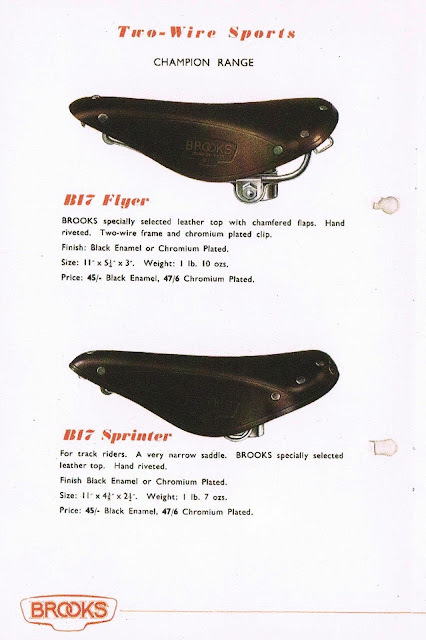 I was wondering if you knew places in Perth where I can maybe find old vintage bicycle parts? I know I can always try online but after reading on your post about bikeville I had my doubts. In my experience bikeville.com would be an exception to the rule. Very few bicycle component sellers are dodgy because they would like repeat sales to you. Good service also helps their marketing efforts by purchasers spreading the news of good service delivery amoungst their cycling friends. 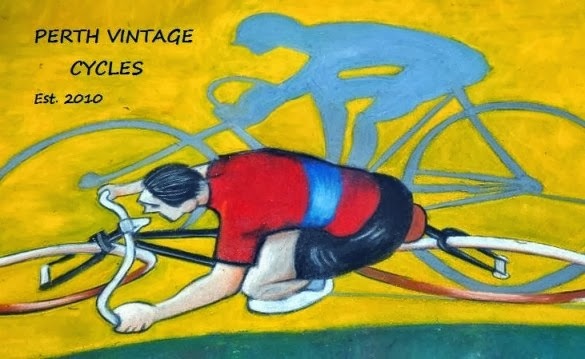 Ebay is great for vintage cycling parts because if you pay by Paypal you have free access to a system that resolves any problems that may arise with the transaction. I have been looking for this saddle to add to a 1926 racer I have for years. would you be willing to part with it to be reunited with a 1926 track bicycle?